Want to learn practical skills to manage difficult emotions such as stress, grief, anger, depression and anxiety? Enjoy a forest sanctuary in Otford, only 75 minutes south of Sydney's CBD. 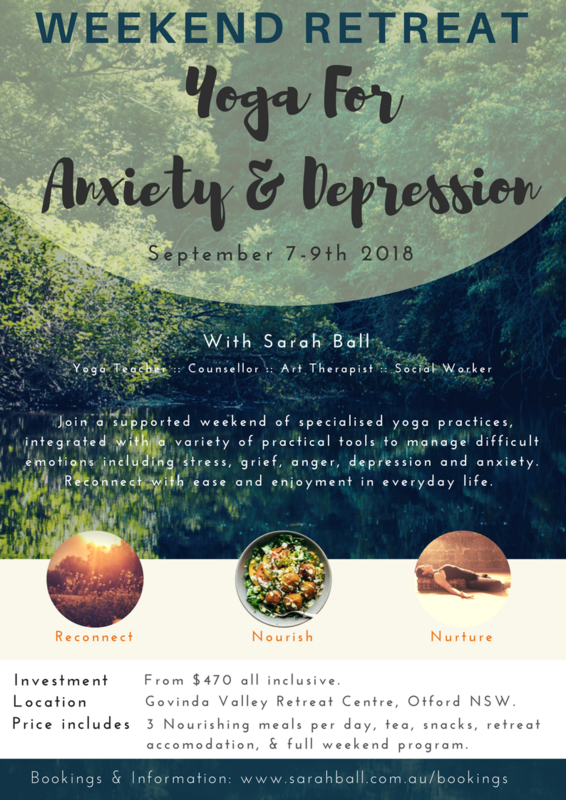 Savour the opportunity to unwind, relax, and learn valuable skills to support mental health that will travel with you beyond the weekend retreat. Leave feeling reconnected and supported with powerful tools, practices and ways of understanding, that can easily be integrated into everyday life to enhance wellbeing. This retreat is suitable for beginners and experienced practitioners alike. The weekend is held in a safe, supportive environment. Spaces are limited to twenty participants to allow plenty of opportunity for direct support. It is recommended to book as early as possible to avoid missing out. Powerful strategies that allow you to feel more ease and enjoyment in your life, whilst gently increasing physical strength, flexibility, and overall sense of wellbeing. Specific methods based on the principles of yoga and evidence-based scientific research, that offer real relief for difficult feelings. Guided practices, with recommendations for addressing particular emotions in your own life. Breathing and relaxation techniques which bring about more calm and positive states of mind and body. Therapeutic yoga postures which help you release stress and activate the rest-relax response in the nervous system. Methods for developing a home yoga practice to support you in achieving and maintaining emotional equilibrium. A tool-kit of techniques that can be used in daily life at any time. Daily morning and evening yoga and relaxation classes, integrating in a variety of yoga methods. Morning and afternoon philosophy, discussion and journaling sessions to assist in integrating the ways in which yoga can support anxiety, depression, mental health, and overall wellbeing. Delicious, healthy vegetarian meals served three times daily, as well as tea and snacks. Relaxing atmosphere in the picturesque forest environment on the edge of the national park. Free time to enjoy bushwalks, other adventures, or simply relaxing in the beautiful surrounds. Retreat accommodation amidst the trees, sound of the birds, and vast night sky. Please note: while enrolment in the retreat includes a full program, attendance in all aspects of the program is optional and can be participated in according to your preferences and needs at the time of the retreat. You have a choice of four accommodation options. All prices include two nights accomodation, six nourishing vegetarian meals, and the full weekend retreat program. $470 Camping OR Staying Offsite. If camping, you’ll be provided a luscious spot in the forest surrounds of the retreat centre. You'll need to bring your own tent, bedding & towel and will have full access to shared bathrooms. If you choose to stay offsite & arrange your own accommodation, your registration will include the full retreat program from morning to evening, as well as 6 nourishing meals across the weekend. $670 Ensuite Room Twin Share. All inclusive. Only 6 rooms available!